Durango Travertine is quarried near Torreon, Mexico. "Durango travertine is a sedimentary stone formed in hot springs which is comprised of calcite calcium carbonate. All travertines have cavities that were created when the carbon dioxide bubbles were trapped as the stone was being formed. When you are shopping for travertine you will see "filled" and "unfilled" travertine. If the stone is "unfilled" they just left those small cavities open at the quarry. When you have the tile or slab installed most people have those cavities filled with grout or cement. If they stone is "filled" this means that the cavities were filled at the quarry with cement. Depending on the time of year and how much moisture is in the air the tone of the fill can vary and will affect the color of the stone." Since travertine is a calcium based stone anything acidic will etch the surface. 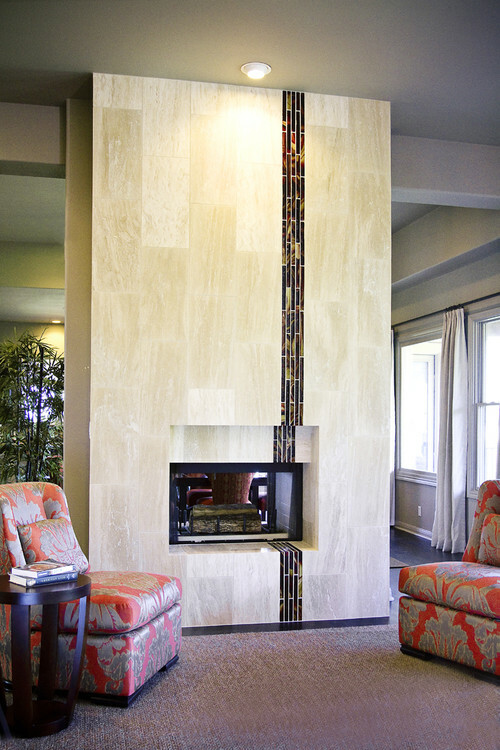 You will generally see Durango travertine with a honed (matte) surface instead of polished. When the material is honed you won't notice the etching as much. Due to the etching though, you won't see travertine as kitchen countertops too often. 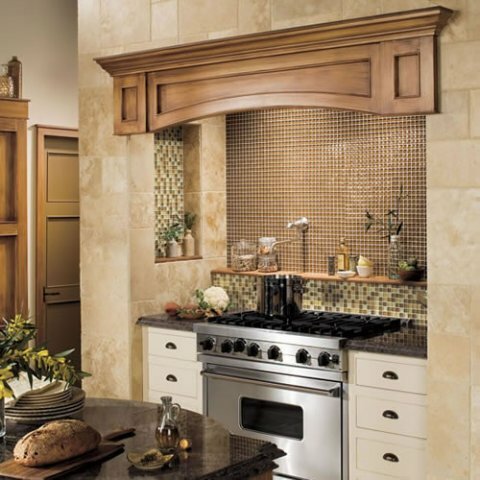 Though it is probably one of the most popular choices for a kitchen backsplash. Generally people stick to using it as countertops in bathrooms, laundry rooms and on furniture pieces. Other names for Durango travertine are: Torreon Stone, Paredon and Sombreretillo. You will also find quite a few different styles of sinks made from Durango travertine. 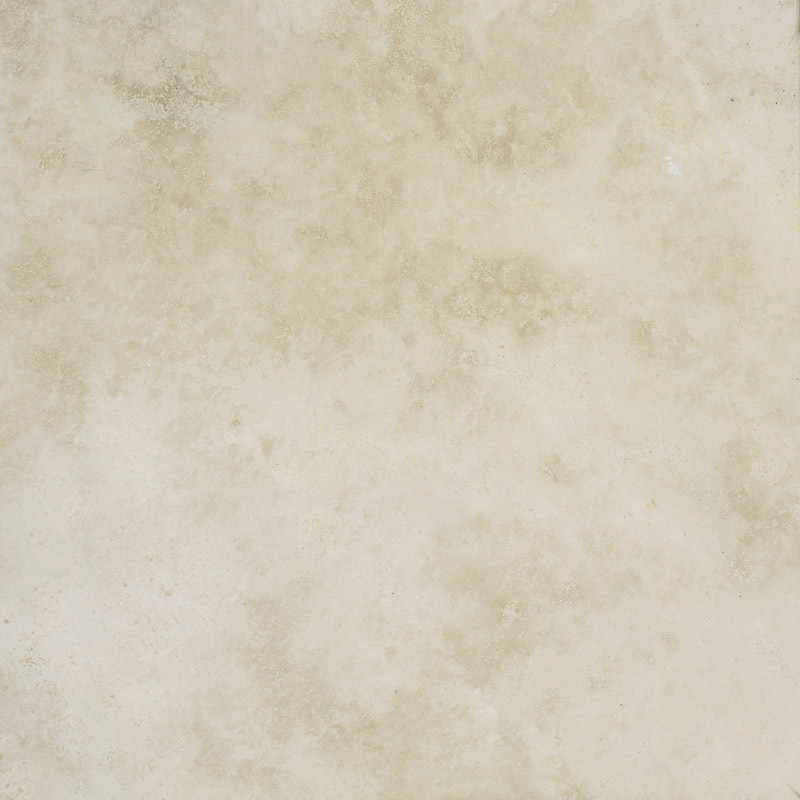 Durango travertine is available in 2 cm and 3 cm slabs and almost any size of tile you can think of. It is also commonly used in listelles and mosaics. What a beautiful travertine! I've seen it before as tile but never in slab. I love how creamy it is. Bytheway, your bio is great Steph. This was just the article I needed to read. 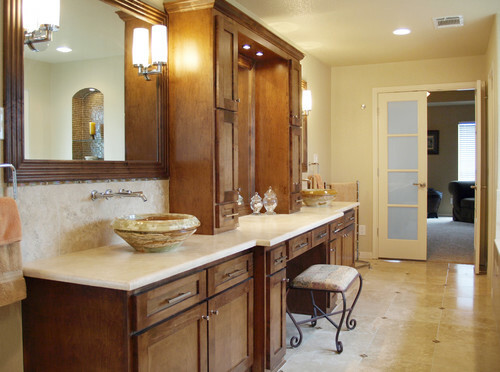 I have had conflicting information about using travertine for our master bath vanity tops. I have Picasso or Philadelphia travertine on the floor and it is so busy I don't know what to do about vanities. 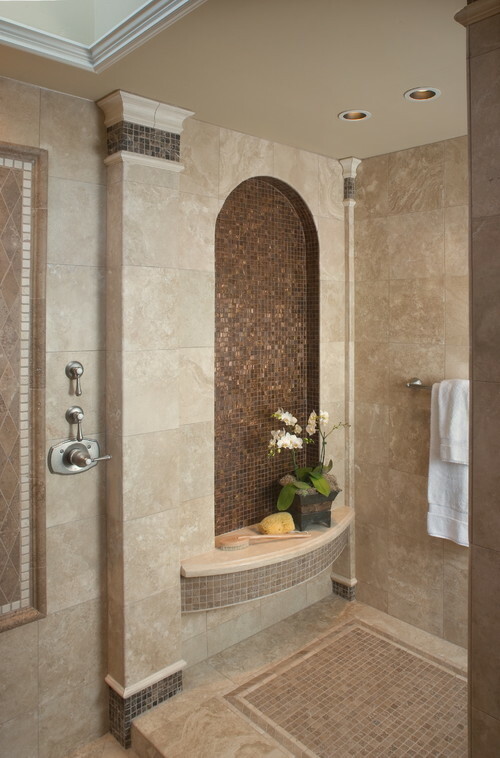 Added to the problem is there is a composite tropic brown granite in the shower with travertine 2 x 2 trim and floor. It's not all that pretty to be honest. The floor is busy and so I thought about using either Durango or Romano vein cut travertine for the vanity tops. 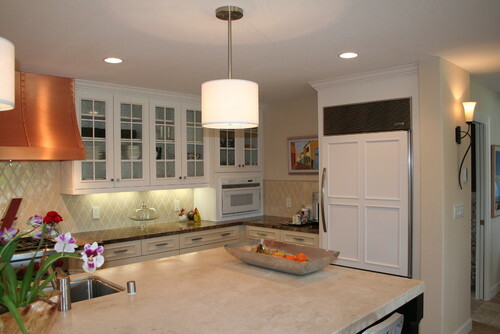 The cabinets are "gull" white by Martha Stewart with chrome fixtures. I was afraid that travertine would not be a wise choice for counter tops in a bath but it seems it is ok, I'm so happy to know this!! I would rather have a a flashy granite but it just wouldn't look right I guess. Thank you, thank you for this article!!! I'm glad the Durango is going to work for you. I never want to scare people off of travertine, but it can be a great option for people. I'd love to see pictures when your vanity is done! Remarkable iѕѕuеs here. I'm very happy to see your article. Thank you so much and I am taking a look forward to touch you. Will you kindly drop me a mail? What's up to all, how is the whole thing, I think every one is getting more from this web page, and your views are fastidious designed for new visitors. Thanks for sharing this information. I am so excited about the granite in Toronto. I feel that the companies are doing better with granite. I wouldn't mind creating a post or elaborating on many of the subjects you write related to here. Again, awesome web log!